A ball game that combines physical activity with stimulation of social interaction and reminiscence. 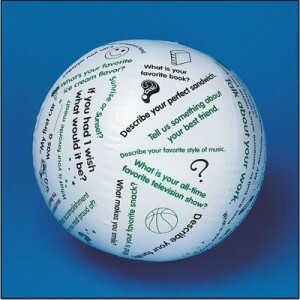 Conversation Ball Getting Acquainted is a beach ball sized inflatable conversation ball that is printed with instructions and questions to encourage social interaction, reminiscing or exploring feelings. The ball is passed around or tossed around and caught by a player. The player follows the instruction that has been selected by the position of one of the player’s thumbs. e.g. Name a favourite food when you were a child, what is the best gift you have ever received?, what is your favourite sport? Activity ideas for group and one to one sessions included. Balloon pump, sold separately, is required for inflation.